With one highly successful invite-only tournament now in the books –the Party Poker Premier League VI– the World Series of Poker is trying to capitalize on its success, announcing the return of the Caesars Cup this week, which will be held at the inaugural WSOP APAC series on April 14, 2013. The WSOP also announced the captains for the three regions that will battle for the Caesars Cup title: Phil Ivey will head the team representing the USA: Sam Trickett will captain the European squad: and Joe Hachem will captain the hometown team from the Australia/Pacific region. The Caesars Cup is loosely based on golf’s Ryder Cup, where a team captain makes player selections from their region and the participants play in heads-up and team matches trying to accumulate more points than the opposing team. Even though the tournament was meant to be played every year, for whatever reason the Caesars Cup has been running bi-annually: In 2009 Team Europe crushed Team America in the inaugural Caesars Cup event, but in 2011 Phil Hellmuth captained Team America to a victory over Team Europe. The three captains named for the 2013 Caesars Cup are among the biggest names in poker, and all three men will have plenty of talent to choose from when selecting their teams –although these decisions usually come down to who is actually in Australia for the WSOP APAC to begin with. The Caesars Cup will be returning after a one-year hiatus, and this will be the third running of the event that was first conceived back in 2009. But this will mark the first time that the Pacific Rim will field a team in the Caesars Cup, with prior events pitting US teams vs. European squads. The Caesars Cup will be one of three WSOP APAC events televised by ESPN, and all three Caesars Cup formats are expected to make the cut in what will likely be a highlight-type episode: The first format will be a team match where two players from each team are chosen with alternating decisions street-by-street. The second format is a fairly unique one, where two players from each team will play in synchronized heads-up matches with the twist being that they share the same chip-stack. The first being Alternative action – where teammates will take turns playing a hand street-by-street. The third format will only be used if there is a tie, and will pit players from each team in standard heads-up matches. 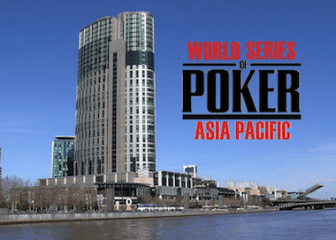 The WSOP APAC series will begin on April 4th, and run through April 15th at the Crown Casino in Melbourne, Australia. In addition to the Caesars Cup, the WSOP APAC series will feature a Main Event, a High-Roller tournament, and several full WSOP bracelet events; the WSOP APAC tournaments will also count towards the WSOP Player of the Year race.